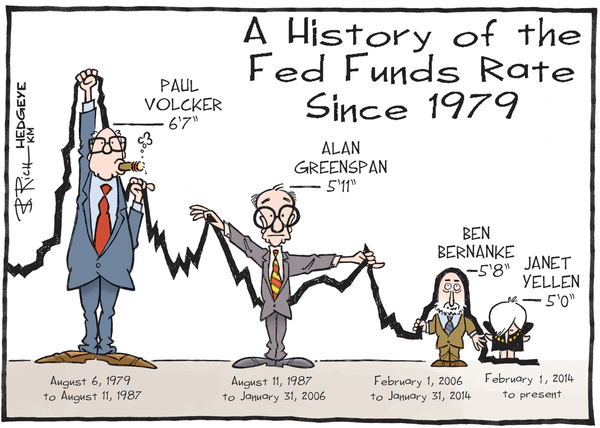 Hedgeye - Hedgeye Guest Contributor | Thornton: Will the Fed Raise Rates Before the Election? Hedgeye Guest Contributor | Thornton: Will the Fed Raise Rates Before the Election? Editor's Note: Below is a Hedgeye Guest Contributor research note written by Dr. Daniel Thornton. During his 33-year career at the St. Louis Fed, Thornton served as vice president and economic advisor. He currently runs D.L. Thornton Economics, an economic research consultancy. A brief note on our contributor policy. While this column does not necessarily reflect the opinion of Hedgeye, suffice to say, more often than not we concur with our contributors. In the piece below, Thornton writes of current Fed policymakers, "I hope that the next president, whomever that may be, has the foresight to change the guard." CNN Money posted this headline on April 27: Will the Fed raise rates before the elections? The correct response, of course, is: Who cares? The reality is that no one should because a 25 basis point move is irrelevant for economic activity. One would only care if one believes that raising the target for the funds rate is a signal that the Fed will shrink its balance sheet back to the point where bank excess reserves are once again trivial—about $2 billion. But, of course, the Fed is not poised to do that anytime soon. Instead, the Fed will continue to make tiny, 25 basis point, adjustments to its funds rate target. More troubling, markets will continue to believe that the Fed (the European Central Bank, and other central banks) have considerable control over interest rates beyond the essentially meaningless federal funds rate. If this were not the case, CNN Money would never post such a headline. As I pointed on in a previous Common Sense Economics Perspective, the Fed’s ability to affect interest rates stems, in part, from the fact that price discovery in the credit market is difficult. Hence, lenders are looking for an anchor for their lending rates. The belief that the Fed can control interest rates provides such an anchor. Indeed, this belief has allowed the Fed to control the federal funds rate very tightly simply by announcing its target for the rate—no actions were required. I am sympathetic with my economist friends who find it difficult to believe that the Fed has been able to control the funds rate simply by announcing the target and, in so doing, has distorted interest rates on a variety of assets: Can the Fed have such power simply because market believes that it has it? The evidence I have found elsewhere, plus the previously mentioned difficulty of price discovery in the credit market strongly suggests the answer is, yes! Specifically, I show that the Fed controlled the funds rate with open mouth operations, not open market operations, and that, in so doing, distorted Treasury yields along the yield curve out to five years. Hence, I am not surprised that the Fed’s 7-year zero interest rate policy, and its quantitative easing, forward guidance, and Operation Twist policies have had even a larger detrimental effect on interest rates in the broader credit market. The distortion of interest rates is detrimental because it causes credit to be allocated differently than it would have been otherwise. Policymakers should interfere with the allocation of credit if, and only if, they can allocate credit better than the market can. I don’t believe that this is ever the case. The bottom line is this: Any economist worthy of the name knows that the Fed can only have a significant effect on interest rates if the market believes that it can. Hence, interest rates could return to more normal levels if the Fed would simply admit that this is true. Of course, this cannot happen under current Fed leadership because it is too heavily invested in the policies of the last 7+-years. This can only happen with a changing of the guard. I hope that the next president, whomever that may be, has the foresight to change the guard.